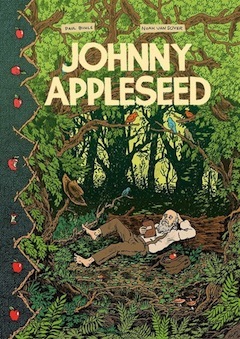 The “first scholarly comic art biography of the legendary John Chapman,” otherwise known as Johnny Appleseed, has arrived. A quick inspection reveals 112 ravishing pages that tell the true story of the man who became famous two centuries ago for “spreading the seeds of apple trees from Pennsylvania to Indiana.” To quote the publisher, Johnny Appleseed: Green Spirit of the American Frontier is a “counter-narrative to the glorification of violence, conquest, and the ‘winning of the West’” as usually chronicled. Drawn by Noah Van Sciver (author of The Hypo and Fante Bukowski,and a member of Mad Magazine’s “usual gang of idiots”) and written by radical historian Paul Buhle (formerly a senior lecturer at Brown University and coeditor of the Encyclopedia of the American Left), the book points out that Chapman operated not only as a believer in “nonviolence and vegetarianism, good relations with Indians, and peace among the settlers themselves,” but also as a sort of land speculator, “purchasing potentially fertile acres on contract (such as ‘bottom land’), planting saplings, reselling the land, and then moving onward” with “less interest in becoming prosperous than in spreading” his peace-and-love gospel.Not incidentally, his apples were prized “mainly for the making of hard cider, portable alcohol.” Which certainly helps to explain why he became such a popular legend. This entry was posted on 3 November, 2016 in homepage and tagged Jan Herman, John Chapman, Johnny Appleseed, Noah Van Sciver, Paul Buhle. Bookmark the permalink.